✔ Can use COMcheck to show compliance. ✔ Can use REScheck to show compliance. The Michigan Uniform Energy Code (MUEC) is promulgated by the Department of Licensing and Regulatory Affairs (LARA, formerly DELEG) Bureau of Construction Codes and is evaluated for revisions or modifications every three years. The Bureau of Construction Codes in the Department of Licensing and Regulatory Affairs (LARA, formerly DELEG) reviews the MUEC every three years in concurrence with the national model code cycle. Section 1972 PA 230 states that the director of the construction code commission shall add, amend, and rescind rules to update the commercial chapters of the Michigan energy code not less than once every three years to coincide with the national code change cycle. However, this document also states that, commencing with the 2015 national code change cycle, the director shall add, amend, and rescind rules to simultaneously update all chapters of the Michigan residential code not less frequently than once every six years or more frequently than once every three years as the director determines is appropriate. This code change cycle process was enacted by House Bill No. 4561 in 2012. According to the 2015-2016 rules status chart, the new commercial energy code will be effective by early 2017. The October 1st Michigan Register gives notice that the state is updating its commercial energy code to be based on the 2015 IECC and ASHRAE 90.1-2013 with amendments. The Department of Energy, Labor and Economic Growth (DELEG) becomes the Department of Licensing and Regulatory Affairs (LARA). The 2009 Michigan Uniform Energy Code (MUEC), Part 10 (Residential) and Part 10a (Commercial), filed with the Secretary of State on November 8, 2010, become effective. The rules adopt the 2009 IECC with Michigan amendments and ASHRAE Standard 90.1-2007. The Department of Energy, Labor & Economic Growth (DELEG) Bureau of Construction Codes holds a public hearing to receive public comments on proposed amendments to the Michigan Uniform Energy Code (MUEC), Part 10 (Residential)and Part 10a (Commercial). The proposed rules would adopt the 2009 IECC with Michigan amendments and ASHRAE Standard 90.1-2007. The MUEC is currently based on the 2003 IRC and ASHRAE 90.1-1999). The Michigan Climate Action Council (MCAC) releases its Climate Action Plan. The 2003 MUEC becomes effective. The Department of Labor and Economic Growth (DELEG) establishes a committee to review and update Michigan’s Uniform Energy Code. After review and promulgation of the code, the Ingham County Circuit Court issued an injunction to halt the February 28, 2005 effective date of the rules in response to a lawsuit by the Michigan Association of Home Builders (MAHB). The new code was not implemented between 2005 and 2008 while litigation was before the courts. On October 24, 2008, the judge presiding over the litigation dismissed the MAHB complaint and dissolved the lawsuit, making the rules effective immediately. Therefore, every unit of government enforcing the single state construction code had to apply the 2003 Michigan Uniform Energy Code to newly issued permits. The 2003 MUEC was based on the 2003 International Residential Code (IRC) with references to the 2004 IECC supplement and ASHRAE Standard 90.1-1999. 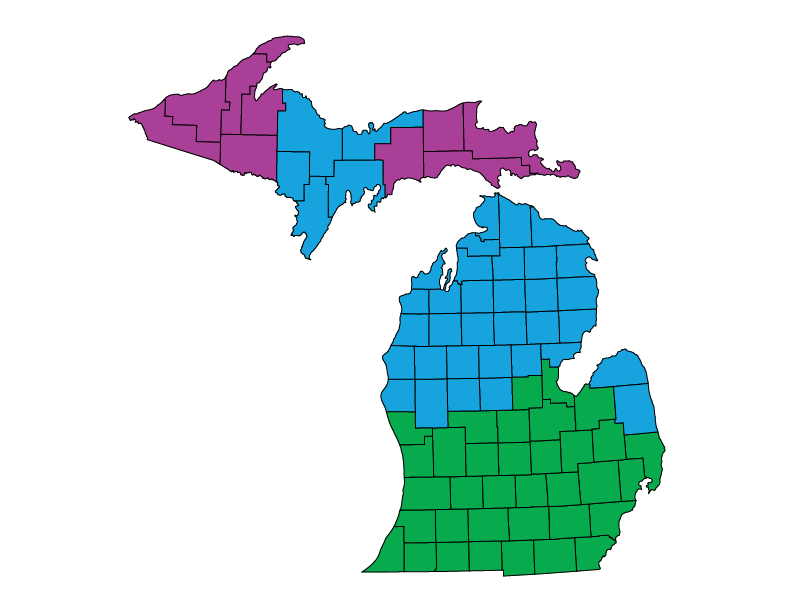 The Michigan Uniform Energy Code Part 10 Rules are updated. SB 719 repeals the 1995 adoption of the 1993 MEC. The legislation directs the state construction code commission to, by April 1, 1997, provide cost-effective standards and establish a program to provide home buyers with energy rating information. A 10-member ad hoc committee is established to assist with these efforts. The state adopts ANSI/ASHRAE/IES Standard 90A-1980 statewide. The state adopts ASHRAE/IES Standard 90-1975 statewide. Prior to this date, the state of Michigan had no building energy efficiency requirements.